This entry was posted in sensory description and tagged John D. MacDonald, Jordan Dane, Michael Connelly by James Scott Bell. Bookmark the permalink. And the sense of smell is closely linked with memory and emotion (for the anatomically minded, “The olfactory bulb has direct connections to two brain areas that are strongly implicated in emotion and memory: the amygdala and hippocampus.”). Using smells offers a lot of potential to show a character’s history, dribble in back story, etc. I know that the smell of bird seed takes me right back to my great aunt and uncle’s chicken ranch, where I helped feed the chickens when I was a very young child. Great insight, Terry. Smell is an excellent way to get into backstory or flashback. The smell inside a donut shop always takes me back to the Helms Bakery van of my L.A. childhood. It would make weekly stops in the neighborhood, toot a unique whistle, and the Helms man would open the back and pull out this gigantic drawer of donuts as all the kids crowded around. I used to run up the block when I heard the whistle (remember the “H” cards you put in the window so he’d know to stop), and Herbie would let me ride in the truck back to my home. It was a slice of Heaven. The jelly and glazed and powdered donuts! Big and fat! My mom always got a cake, and I can’t remember what kind, but it was full of raisins and had a gooey frosting. I think it was their applesauce cake. Dang, you’re making me hungry. It’s also important, maybe, to note that the sense of smell is tied closely to the sense of taste. A certain aroma or scent might evoke in the POV character a memory of Granny’s mouth-watering biscuits baking in the oven or (if perfume or flowers) a first date or (if the smell of a copper penny on the hand) a particularly bloody scene from the past. All of which can tell the reader more about the character him- or herself. I try to invoke all five of the POV character’s physical senses plus the “emotional” sense (fear, joy, trepidation etc.) in every major scene. Of course, that isn’t always possible, but when it works, it always puts the reader in the setting and scene with the character(s). I think it was Sol Stein who advocated at least one sensory description on every page. It’s not bad advice, though I would wait until revisions to check that out. Then you know what a scene is about and can sensory-it up accordingly. Indeed, one striking sensory image is worth a ton of narrative summary. Thank you for this reminder, Jim! I made a memo for me while plotting my next novel to remember all senses and pay attention to smell especially. Once while smelling a delicious tomato sauce from far away on a trip in Sicily, I realized that smell is a time machine, because it reminded me of the tomato sauce made by my mother when I was small. Exactly, Victoria, along with what Terry said, above. Smell can take us immediately back in time. I also find that with songs. To this day when I hear “Bridge Over Troubled Waters” I go back to a specific high school night when it was playing on my car radio as I pulled up to a gym to play some pickup basketball, while being in love…and played spectacularly that particular evening. I love using the senses in writing & reading it in other author’s work. It conveys so much, even something like the lingering stench of cigarette smoke to mark the passage of time & conflict. One of my childhood experiences was having to report to the police that I may have found a dead body. At the stables where I kept my horse, I’d found in a burlap sack in the shape of a crumpled body inside. I called the police & they crept toward the foul smelling body. Very intense waiting game & of course I watched. It turned out to be a dead German shepherd, poor baby. Someone didn’t care enough to bury him. But I never forgot the stench that seemed to stick to you. Connelly’s notion of breathing decaying flesh into your nostrils is on point & very creepy. Perfect. Ha! I set the book in my hometown BECAUSE no other writers seemed to portray my favorite TexMex restaurant to the fullest extent. Mi Tierras is a must visit in San Antonio. I knew how loud the mural room is & made sure my detectives ate there on purpose, to not be under surveillance. Thanks for the feature, Jim. Happy Sunday. 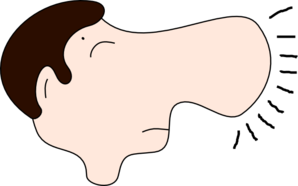 Certain medical conditions cause a loss of smell (anosmia). If it’s serious enough, you can lose your sense of taste (ageusia) as well. The inability to taste what you eat leads to another health complication, a loss of appetite. And smokers who quit are often amazed at how smelly their world becomes as they regain the sense of smell. That’s when they start preaching to other smokers about their odorous habit. I’d hate to give up either sense. So I’m pouring another cup of coffee right now, just to test them out. Really, it’s all in the name of science. Excellent post. Love the excerpts. I do try and use smell as much as possible, but have been guilty of using it mostly for outdoor settings. Good idea to include indoor as well as the snippets you shared eloquently show. I read this meme on social media. I thought it was an excellent description of smell. I am not saying your perfume is too strong. I am just saying the canary was alive when you got here. Thought that was a great line. Thanks, Jim, for the reminder to include the olfactory sense experience. As others have said, it’s a powerful pull on the reader when done right. Maybe it’s my own memory, ala Harvey’s comment, but I realized after publishing my Sumerian prequel about a girl child roving the world with a cobra companion how often I used smell. Everyone who approaches the cobra senses the snake’s skin odor first, and finds it appealing in spite of an innate fear or loathing. I haven’t been near a snake since my childhood on an avocado ranch, mostly king snakes and red racers. The associative memory must run deep in my psyche. Dan, I’ve also found using the sense of smell (among the other physical senses) combined with the POV character’s opinion of the setting is a powerful tool to reveal the character of the character. For example, on entering a formal library in a mansion in which a crime is centered, one POV character might be transported to her childhood by the lingering “sweet scent” of pipe smoke. Another might recoil at the “stench.” To one, the dim lighting might be “soothing,” and to another “forbidding,” etc. I love the psychological nuances or insights that can be introduced to a story via the the POV character’s physical senses and opinions of the setting. Harvey, I like your idea of contrasting two characters’ different reactions to the same odor as a nuance of character. I’ll tuck that one away for sure. Thanks. The great science fiction and fantasy writer Poul Anderson recommended that a writer should use at least three of the five senses in each scene to bring it alive. Good advice, and brain science about reading now agrees. Triggering the senses in the brain is the best way to make a scene real and pull the reader in. I can’t smell Evening In Paris without thinking of my mom. Or red lipstick, but only the kind they used to sell at Kresge’s. It smelled like cotton candy. For my paranormal series, I have talked to people who claim to have encountered various kinds of cryptid creatures. I’ve asked them what these things smelled like, if their encounter was, supposedly or otherwise, close enough to catch any scents, reeks, or emanations. I’ll just say this: if any of y’all decide to out cryptid hunting, be certain you take humongous supplies of Febreeze. By the way, did you know there are alleged to be bigfoot-like creatures running around the deserts of Southern California? There is, supposedly, a photograph of one in Palm Springs. Would a Palm Springs bigfoot wear Lalique for Bentley Crystal, or would he settle for Aqua Velva? I don’t know what Bigfoot would smell like, but if he’s in Southern California I will bet he is working on a screenplay. I’m still laughing, Sir. Great line. Growing up, we had a neighbor kid we called Sasquatch. He wasn’t keen on hygiene. Nuff said. Great story. What do you suppose a bigfoot would say to the kids if he were offended by how they smell? Great advice and the timing couldn’t have been better. I just finished a story centered around the sense of smell. I try to engage all of the senses when I can, but smell seems to be the strongest memory trigger. It can really pull a reader into the scene.